Periodontal (gum) disease is a progressive bacterial infection caused primarily by bacterial plaque on tooth surfaces not adequately removed by daily oral hygiene. In fact, nearly all of us will develop gingivitis (inflammation of the gum tissues) if we fail to clean our teeth and gums for an extended period of time. Some people, however, have a greater susceptibility for developing gum disease because of other risk factors not related to hygiene. 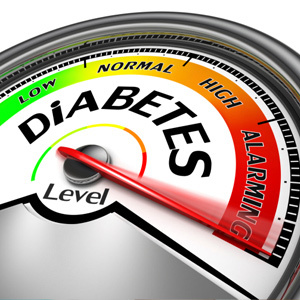 Patients with diabetes are at particular high risk for acute forms of gum disease. Diabetes is a chronic condition in which the body can’t adequately regulate the bloodstream’s levels of glucose, the body’s primary energy source. Type 1 diabetes is caused by inadequate production in the pancreas of the hormone insulin, the body’s primary glucose regulator. In Type 2 diabetes the body develops a resistance to insulin’s effects on glucose, even if the insulin production is adequate. Type 1 patients require daily insulin injections to survive, while most Type 2 patients manage their condition with medications, dietary improvements, exercise and often insulin supplements. Diabetes has a number of serious consequences, including a higher risk of heart disease and stroke. Its connection with gum disease, though, is related to how the disease alters the body’s response to infection and trauma by increasing the occurrence of inflammation. While inflammation is a beneficial response of the body’s immune system to fight infection, prolonged inflammation destroys tissues. A similar process occurs with gum disease, as chronic inflammation leads to tissue damage and ultimately tooth loss. Researchers have found that patients with diabetes and gum disease may lessen the effects of inflammation related to each condition by properly managing both. If you’ve been diagnosed with either type of diabetes, proper dental care is especially important for you to reduce your risk of gum disease. In addition to effective daily brushing and flossing and a professional cleaning and checkup every six months (more frequent is generally better), you should also monitor your gum health very closely, paying particular attention to any occurrence of bleeding, redness or swelling of the gums. If you encounter any of these signs you should contact us as soon as possible for an examination. And be sure to inform any dental professional that cares for your teeth you’re diabetic — this could affect their treatment approach.